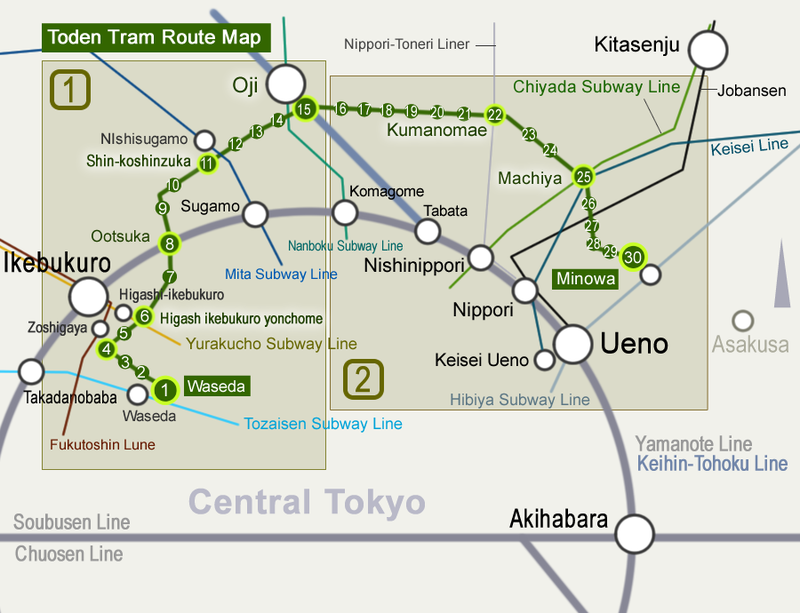 Toden Arakawa-sen(line) is a streetcar system served between the historic neighborhoods Waseda and Minowa, in the northern area of Central Tokyo. 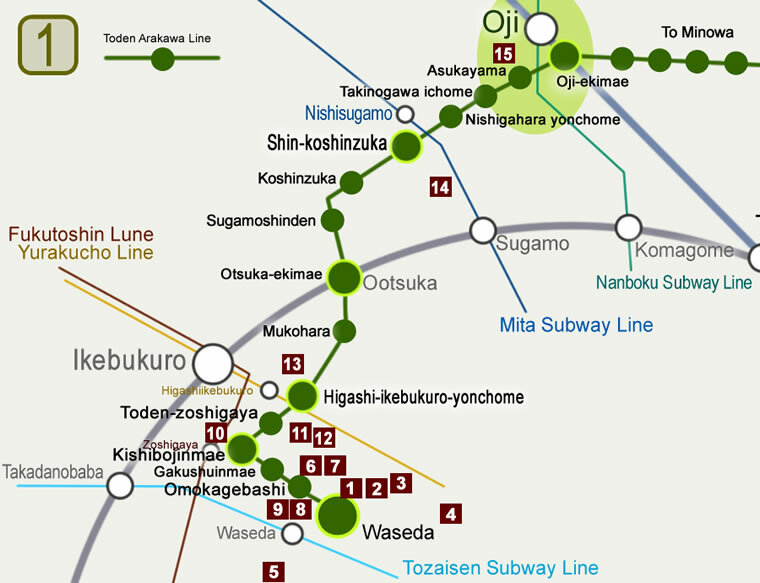 There are various attractions along the tramline, such as Japanese gardens, temples, old shopping streets, and Sakura viewing spots, allowing you to have a short tour and enjoy a nostalgic, friendly atmosphere. A traditional Japanese garden with a focus on the spring pond that lies in a residential area where shogun's retainers used to live. Admission Free. *The name of this garden has changed as of March 18 2017. The historic place where Matsuo Basho, a renowned haiku poet master, had lived around 1677. This place remains the view of his house and the garden in that time. The Hotel Chinzanso Tokyo is a luxury hotel with exclusive banquet halls, upscale restaurants, and a large classical Japanese garden that delights visitors with its seasonal beauty. The garden’s admission is free. The Chinzanso Garden is next to Sekiguchi Bashoan. A river-side garden along Kandagawa river, known as a Sakura viewing spot with 230 of the trees. Admission free. This historic shrine is known for the lucky charm bringing fortune. A great Sakura viewing spot on the side of the Kanda River, some cherry trees bloom in spring. Tomita Somekogei is a traditional dyehouse that has been in operation over 140 years in Tokyo. They offer Kimono dyeing lessons* as well as free tours that allow visitors to observe their actual dyeing works. Admission is free. *Reservation is required for Kimono dyeing lessons (paid). 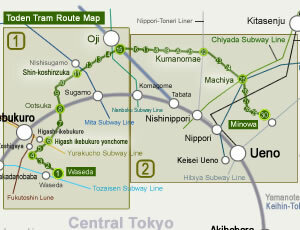 15-min walk from Takadanobaba Station on the JR Yamanote Line. Kansenen is a Japanese stroll garden with a central pond, used to be a site of Daimyo or feudal lords’ residence more than 300 years ago. Mizuinari-jinja Shrine Kansenen Garden, known for the oldest Fujizuka, a mound made in the image of Mt. Fuji. 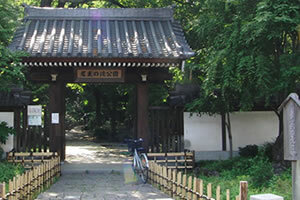 The shrine is located next to Kansenen Garden. Admission Free. A shrine dedicated to Kishimojin, the goddess of child-rising and easy childbirth. 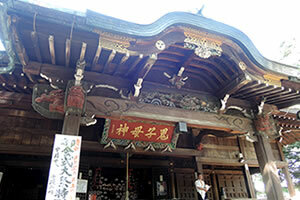 This shrine is located in Zoshigaya area, favored by LOHAS people. The handcraft market “Tezukuri-ichi” is held monthly at the Kishimojin shrine and Ootori-jinja shrine nearby. To find the schedule, see their website. The former residence of John Moody McCaleb, an American missionary who lived there for 34 years before returning to his homeland in 1941. Built in 1907, this two-story wooden house is one of the oldest western-style houses in Tokyo. The Sunshine City is a commercial complex that includes shopping malls, restaurants, a theatre, office convention halls and an aquarium. Anime events are often held at Sunshine City. The famous Anime store "Animate" is located in front of the Sunshine City. 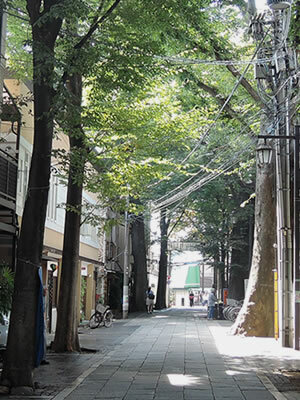 3-min walk from Higashi Ikebukuro Yonchome Sta. on the Toden Arakawa Line. 3-min walk from Higashi Ikebukuro Sta. on the Yurakucho Subway Line. 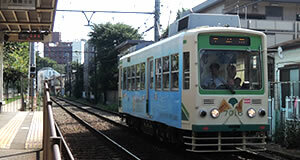 10-min walk from JR Ikebukuro Station (East Exit). Sugamo Jizodori Shopping Street is an old shopping street at the front approach of Koganji Temple, known for Togenuki-jizo statue, where many older adults gather to pray for good health and the happiness in the rest of their lives. Since Sugamo town is getting popular, young people also began to visit there to enjoy the good old-fashioned atmosphere. Oji is a greenery, historic town with various attractions, temples, gardens, and museums. Asukayama Koen Park near the JR Oji Station is a great place to enjoy Sakura viewing in spring.